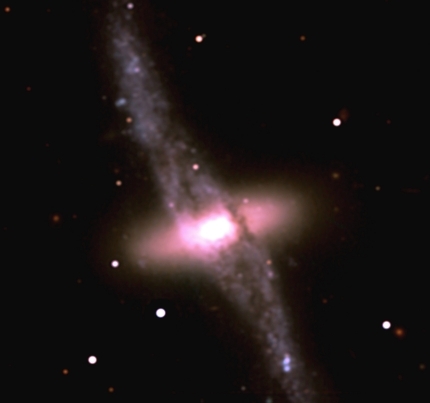 Explanation: This strangely distorted galaxy of stars is cataloged as NGC 4650A. It lies about 165 million light-years away in the southern constellation Centaurus. The complex system seems to have at least two parts, a flattened disk of stars with a dense, bright, central core and a sparse, sharply tilted ring of gas, dust and stars. Observations show that the stars in the disk and the stars and gas in the ring really do move in two different, nearly perpendicular planes, probably as the result of a past galaxy vs. galaxy collision. The observed motions within both disk and ring also indicate the presence of "dark matter" - an unseen source of gravity which influences the movement of this system's visible stars. Over the decades evidence that our Universe is largely composed of such dark matter has grown while the nature of dark matter has remained a profound astrophysical mystery. The picture was constructed from images made using part of the European Southern Observatory's (ESO) new Very Large Telescope system now undergoing its testing phase.